A Crush Injury may be described as an injury caused when a body part is caught or squeezed between (or comes under) heavy objects, such as a boulder, steel girder, or an automobile. What are the Causes of Crush Injury? Some injuries are minor, while others may be major resulting in serious harm and even death. What are the Signs & Symptoms of Crush Injury? Severe Crush Injuries may have complications including crush syndrome, fat embolism, rhabdomyolysis (severe damage of muscles), infection, and shock. How is First Aid administered for Crush Injury? 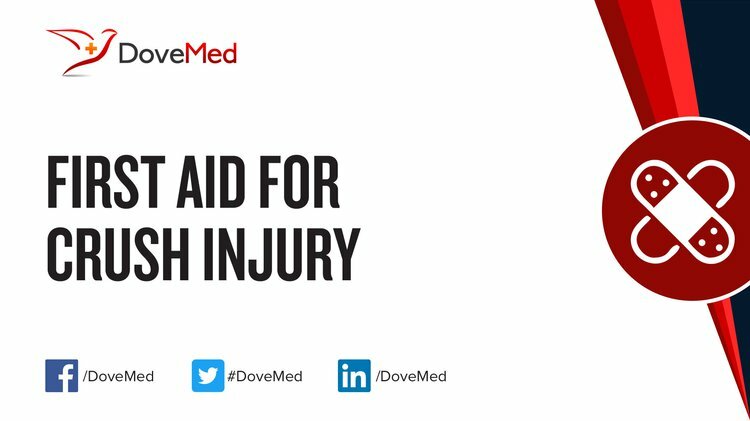 Who should administer First Aid for Crush Injury? What is the Prognosis of Crush Injury? How can Crush Injury be Prevented? Cheng, F. C., Tai, M. H., Sheu, M. L., Chen, C. J., Yang, D. Y., Su, H. L., ... & Pan, H. C. (2010). Enhancement of regeneration with glia cell line–derived neurotrophic factor–transduced human amniotic fluid mesenchymal stem cells after sciatic nerve crush injury [RETRACTED] Laboratory investigation. Journal of neurosurgery, 112(4), 868-879. He, Q., Wang, F., Li, G., Chen, X., Liao, C., Zou, Y., ... & Wang, L. (2011). Crush syndrome and acute kidney injury in the Wenchuan Earthquake. Journal of Trauma and Acute Care Surgery, 70(5), 1213-1218. Bélanger, E., Henry, F. P., Vallée, R., Randolph, M. A., Kochevar, I. E., Winograd, J. M., ... & Côté, D. (2011). In vivo evaluation of demyelination and remyelination in a nerve crush injury model. Biomedical optics express, 2(9), 2698-2708. Britt, J. M., Kane, J. R., Spaeth, C. S., Zuzek, A., Robinson, G. L., Gbanaglo, M. Y., ... & Bittner, G. D. (2010). Polyethylene glycol rapidly restores axonal integrity and improves the rate of motor behavior recovery after sciatic nerve crush injury. Journal of neurophysiology, 104(2), 695-703. Pan, H. C., Yang, D. Y., Ou, Y. C., Ho, S. P., Cheng, F. C., & Chen, C. J. (2010). Neuroprotective effect of atorvastatin in an experimental model of nerve crush injury. Neurosurgery, 67(2), 376-389. Lindsay, R. W., Heaton, J. T., Edwards, C., Smitson, C., & Hadlock, T. A. (2010). Nimodipine and acceleration of functional recovery of the facial nerve after crush injury. Archives of facial plastic surgery, 12(1), 49-52. Alavi-Moghaddam, M., Safari, S., Najafi, I., & Hosseini, M. (2012). Accuracy of urine dipstick in the detection of patients at risk for crush-induced rhabdomyolysis and acute kidney injury. European Journal of Emergency Medicine, 19(5), 329-332. Kim, C. W. (2010). Scientific basis of minimally invasive spine surgery: prevention of multifidus muscle injury during posterior lumbar surgery. Spine, 35(26S), S281-S286.